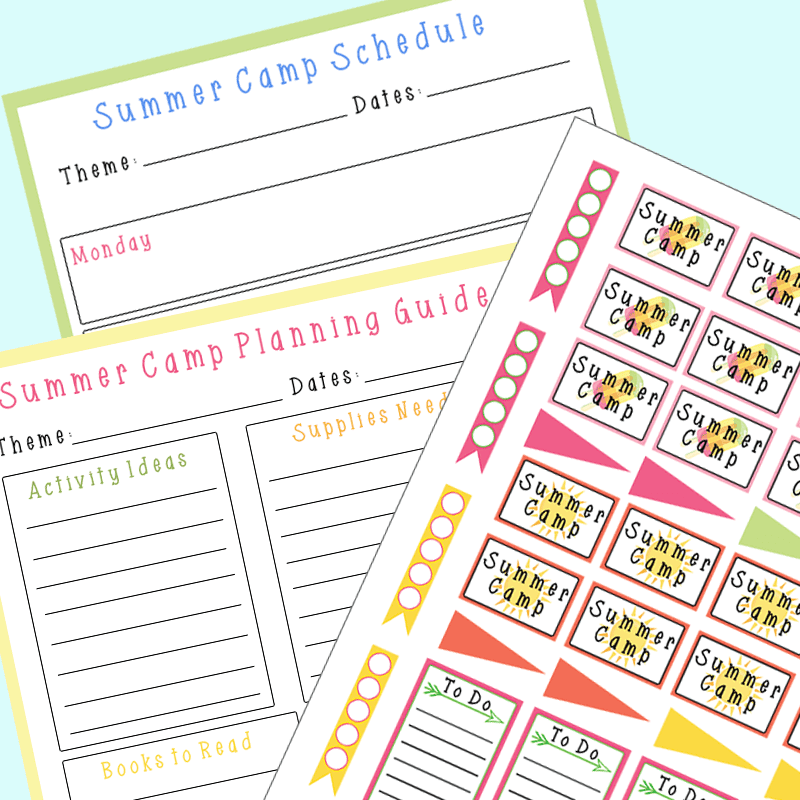 Plan a summer camp at home with a free printable planning guide & summer camp planner stickers too! My twins' first year of preschool is over and now it's time for their first official summer break. We're very excited for some good old fashioned time in the backyard along with trips to the pool and the beach, but I know that they are going to miss the fun and activities that come with their school days. So to keep them entertained we are going to do a few weeks of summer camp at home. An at home summer camp is the perfect way to keep kids learning, engaged in something active, and having fun during their break from school. And it's easy to do! Want to learn how to plan a summer camp at home too? 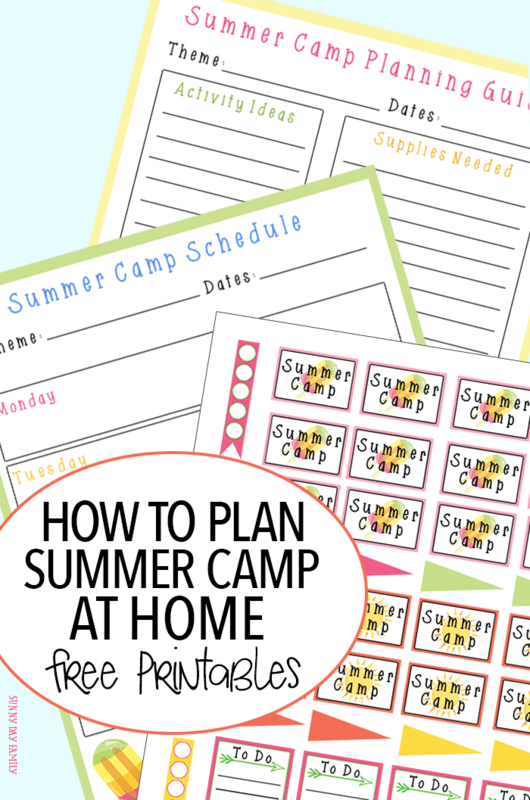 I have a few tips along with an awesome free printable summer camp planner to get you started. Planning a summer camp at home is easier than you think. With a few simple steps, you can plan a fun camp week that your kids will love. And I even have a free printable summer camp planner to guide you through! First, choose a theme. What are your kids interested in right now? Let their likes guide you to choose a theme for your camp. Your theme can be anything from dinosaurs to art to space to STEM. Once you have a theme you can narrow down your activities. Head to the library. Once you've picked your theme, you should grab some books to get your kids excited about camp week. Take a trip to the library or browse on Amazon to find a selection of books that will complement your theme. Decide on your activities. You'll need a good selection of activities for each day of your camp. I recommend a mix of outdoor and indoor ideas, and be prepared in case the weather doesn't cooperate with your plans. Think about games, crafts, and even snacks that tie back to your theme. Need inspiration? Head to Pinterest and check out all the fun activities I've pinned! Plan a field trip or two. Summer camp at home doesn't mean you have to stay home. Brainstorm a fun field trip or two to help break up your week. It can be something like visiting the animal shelter for a pets themed camp (that's on our list!) or even going to the grocery store for a cooking camp. Make a supply list. You don't want to be in the middle of an activity and realize you don't have something you need. Make a detailed supply list before your camp week to ensure you are stocked and ready to go each day! Ready to plan your summer camp at home? You need my free printable summer camp planner to get organized and keep all your plans in one place! This 3 page planner includes a planning guide to take you through all of the steps to creating your camp, a weekly schedule, and a set of summer camp themed planner stickers. Click the Get It Now button below to grab yours and start planning! If you want an easy way to plan a summer camp, you can let me and 11 other awesome bloggers do the work for you with an entire summer of camps! That's 12 weeks and over 60 activities ready made for you. Click here to see the calendar and themes and decide which weeks work best for you. I'm really excited for our Pets themed camp in June! Visit my shop for more printables including planners, kids activities, and more!